the Chehalis Flats Bald Eagle & Salmon Preserve. Media Contact: for any updated information of the Bald Eagles or on the Chehalis Flats Bald Eagle & Salmon Preserve please contact biologist David Hancock 604 761-1025. River & Area Water Levels: If you are wishing to better understand the rivers status please check our Harrison Mills Bald Eagle live cams which show the Harrison River in the background. Or if you wish to see the present Chehalis River turbidity and what fish are running up the river then check our live streaming cam on the Chehalis River at: www.hancockwildlife.org. Why have the local citizens decided to establish this Preserve now? The Harrison Mills area, encompassing the Chehalis Flats alluvial fan which spread out into the Harrison River, just north of the confluence with the Fraser River, has steadily received more and more human attention. From the establishment of the Chehalis village many thousands of years ago, to the establishment of Kilby to serve the gold rush to hosting pioneering logging and farming families, to the more recent establishment of camping facilities and several permanent housing subdivisions along the shorelines, this area appeals to people. The navigable waters of the Harrison River have linked these people and been their lifeline to civilization. These waters have supported North America’s largest populations of several of the salmon species, one of the world’s greatest concentrations of the sturgeon and a native and sports fishery unexcelled anywhere. Can human use of this area continue to be enjoyed yet reduce the negative impact to the very resource that attracts us all here?” Our citizens committee believes that the challenge is to let the various stakeholders know what the wildlife needs are and how we can honor them. The Chehalis Flats Bald Eagle & Salmon Preserve is defined in both space (on the map) and season (October through February) so you can know when not to intrude – please honor this incredible wildlife resource and it will continue. The Fraser Valley Bald Eagle Festival has promoted the presence of bald eagles in the Harrison Mills area for nearly 20 years. Most recently David Hancock reviewed various bald eagle winter concentration areas in British Columbia and Alaska. The historic evidence clearly shows that bald eagles frequent many spawning rivers throughout the northwest, with large numbers recorded at specific sites like the Chilkat River in Alaska, the Squamish River near Brackendale BC and the Harrison River, a tributary of the lower Fraser River of British Columbia. Just upstream along the Harrison is the alluvial fan forming the Chehalis Flats where the largest concentrations of bald eagles in the world have been recorded. This same river flats is designated part of the first Salmon Stronghold, to signify this is Canada’s most productive salmon river ecosystem. With the Chehalis Flats being both Canada’s most important salmon river and the gathering site of the worlds largest concentrations of bald eagles, this area is very special and deserves our attention. The reasons for these eagle movements up and down the coast and the huge gatherings of eagles on the Chehalis Flats in southern British Columbia are largely two-fold: weather conditions up north and salmon availability for the eagles throughout the area. The food availability locally is driven by the incredible productivity of the Harrison River system salmon runs. Historically we have seen that just having lots of spawned out carcasses does not in itself bring record numbers of eagles. Normally the wintering eagles are dispersed all along the northwest coastal salmon rivers, feasting on the carcasses until they are eaten out or frozen under the ice. As this food source disappears under the ice or is eaten out, the eagles move south. On top of the influence of weather conditions is the actual numbers of salmon actually returning to the different rivers each season. Fewer spawned-out salmon carcasses in the northern rivers simply means, regardless of impacting weather, that less poundage of salmon are there to feed eagles – or bears, gulls, wolves etc. With fewer spawning carcasses to the north, the eagles come south to the Chehalis Flats – the last and greatest salmon run of western North America. The past 15 years has shown a gradual build-up in numbers of wintering eagles at Harrison Mills and this seems to be related to a decline in other spawning salmon populations in northern rivers – and of course due to the generally increasing numbers of eagles. Then in 2010 we had a world record for a gathering of eagles. David Hancock counted individually 7362 eagles in a 3 kilometer section of the Chehalis Flats and probably several thousand more existed in the trees, soaring and spread southward to Harrison Bay (Hancock D above) . This is almost twice the size of any earlier recorded gathering of eagles anywhere in the world. The Chehalis Flats is very special. ith fewer salmon carcasses to the north the eagles kept coming south. We greeted them, and they depend upon, the food resource of the Chehalis Flats, Canada’s most productive salmon river. The Chehalis Flats becomes increasingly import to the entire west coast eagle population. The importance of the fish and the Chehalis Flats alluvial fan are increasingly important to bald eagles. The flats are the southern most of the large salmon spawning areas and offer one of the last great feasting areas for the wintering eagles where they build up reserves for winter and more importantly rest and socialize before again heading heading north for breeding. Studies done over 20 years ago showed that eagle can soar almost effortlessly but can only sustain, even eating as much as possible each day, about 28 minutes of wing-flapping flight each day without losing weight. So not only is eating important but eagles need to rest and loaf on the flats to preserve their strength. Most of the eagles arriving at Harrison Mills and the Chehalis Flats have flown 1500 to 2500 hundred kilometers to get here – and after resting and feeding for the winter, many have to head back to northern British Columbia, the Yukon and Alaska for spring breeding. The Chehalis Flats offers this unique seasonal needs to the eagles — we need to honor these eagles and keep off the Flats between October through February. The kayaking and walking through these flats is a constant disruption to the eating and resting eagles. It simply is a great disservice to flush these eagles from loafing on the flats. They need to feel secure and to not be flushed off their restng grounds. We have seen a number of hikers, photographers and kayakers traverse these Flats and “talk and post enthusiastically” about seeing the eagles flush and the great photos they got!. Unfortunately this is precisely what we need to avoid and this educational program and Preserve is aimed at that. Please honor the eagles and the fish eggs on the Flats by staying off these flats during the most important months — October through February. As might be expected the Harrison Mills area also hosts the world’s largest known eagle night roost: the cirque of hills and ancient lowland forest of cedar and Douglas fir surrounding Echo Lake, immediately west of the Chehalis Flats. Each night and morning the eagles can be seen entering and leaving this ancient roost site. All the large forest trees surrounding the Chehalis—Harrison complex serve as day and night roosts for bald eagles. Once the eagles are sitting in trees they more readily accept people and boats walking or driving by below. The Chehalis Flats cut with the channels for spawning salmon, the surrounding shorelines of giant cottonwoods, the hills along both sides of the Harrison Valley from Mt. Woodside on the east to the Echo Lake cirque and night roost to the west, constitute one of the world’s greatest bald eagle wintering habitats known. The salmon flats of the Chehalis that feed these wintering eagles is a national treasure that needs protecting. For the eagles, they need to rest in peace. Please watch this incredible phenomena from the shorelines or the deep water channels of the Harrison River. Undoubtedly an even bigger issue bearing on the preservation of the Chehalis Flats is the welfare of the vast diversity of spawning salmon and the year-round sensitivity of spawning and rearing habitats utilized by these salmon population. The Harrison River and its tributaries have recently been proclaimed Canada’s most important salmon river and been designated the first Salmon Stronghold in Canada. The aim of the Salmon Stronghold is to preserve the total biological diversity that characterizes this area as one of the most productive rivers in the Pacific Northwest. All 5 species of salmon spawn in this ecosystem along with steelhead, rainbow and cutthroat trout as well as bull trout and a variety of other species that depend upon them for food or share their habitat. Adult salmon, their eggs and fry are present throughout the Chehalis Flats and the adjacent gravel beds every month of the year, and then the juvenile salmon move into the tributaries, river margins and wetlands where some may reside for more than a year after that – growing and feeding other wildlife before finally swimming downstream and into the Salish Sea for the next phase of their lives. Most importantly, some of these fish are present in the river gravels during the time when the water is low and the eagles are present on the Chehalis Flats. This is the prime time of spawning, digging of the redds, the hatching of the delicate yolk sacked fry (alevin) which are particularly sensitive to disruption by foot traffic and shallow water operating kayaks or boats. Well meaning observers on foot or in a boat may inadvertently disrupt spawning or incubating fish in an effort to move closer to observe the activities of eagles, spawning salmon or waterfowl. We need to keep unnecessary disturbance or walking or boating, on the flats to a minimum. Unique Salmon Challenge: Salmon that spawn on the Chehalis Flats are particularly susceptible to foot and boat traffic. Spawners have keyed in on the choice gravels and wetlands, loosened and fed by Harrison Lake runoff and warm groundwater-fed aquifers that still provide flow in late winter. Many juvenile salmon fry will remain in the gravel until late March, their presence obscured by surface gravels that belies their busy life just beneath the surface while they await the spring freshet to carry them free. The goal of the Chehalis Preserve for salmon is to ensure that foot and boat traffic on the soft wetland gravels is minimized after spawning and until inundated with sufficient freshet flows in the spring. I have to admit that the “disturbance concerns” have been talked about for some years by local residents. However, until we recently saw, via our live streaming eagle cams, that show the constant human access to the flats and shallow waters and the repeated disturbance to the fish and feeding and loafing eagles, we was not as fully aware of the problem. These cams could also serve in the future to not just be an educational tool for the benefit of the eagles, salmon and the other wildlife but as monitoring tools. The disturbances are caused by many kinds of intruders. When the water is higher then motor boats, jet skies and joy riders disturb the shallow waters. As the Flats dry out the most frequent and disruptive activities are the kayakers and walkers and photographers. Some have even posted blogs that say how they got away from jet boaters on the deep river channel by accessing the flats to flush the eagles for good close-up photos of the flying birds! Indeed! On one day, when the water was a little higher, we had Sea-Doos, helicopters, jet boats and punt boat hunters out on the flats; dog walkers, off-road bikers, 4wheelers and numerous cameramen with long conspicuous lens and fisherman add to the constant invasion of these spawning waters and the eagle feeding and resting areas. More knowledge of this human intrusion and damage and ultimate respect for this international ecological treasure is needed. The Preserve Campaign: The Citizens Committee hopes that this campaign, that targets the education of the outdoor kayaking and sports clubs, the fishermen and hunters and the naturalist and camera buffs, supplemented by posters at each launch or water access site would go a long way to developing a mutual understanding the wildlife needs. I suspect those wishing to view the glory of our nature wish to do so in a way that is not as totally disruptive as is presently happening. Perhaps this educational campaign will do its job. The salmon, the eagles – the ecosystem – needs more understanding, peace and respect. Some Chehalis Flats conservation etiquette awareness may be all that is needed. 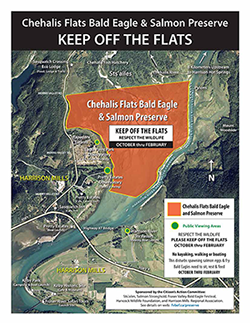 The Chehalis Flats Bald Eagle & Salmon Preserve campaign is designed to educate the public as to a key small section of the habitat that is very crucial and needs protection – including no foot, boat or vehicle traffic on the Flats — between October through February. The purpose of Chehalis Flats Bald Eagle & Salmon Preserve is to initiate some educational program to reduce human disturbance to the loafing eagles out on the flats and protect the shallow waters with eggs and fry from constantly being trodden upon by people, motors and disruptive wakes. From the eagles’ and salmon’s perspective, we see no problem at all with boat, kayak or fisherman traffic along the Harrison River main channel or humans walking along the commercial developments bordering the west or eastern shorelines. We even hope to develop more organized paths and viewing sites. These areas have large trees to let the eagles sit securely, well above the passing humans below. By sticking to the shoreline paths the viewers do not interfere with the eagles or the shallow gravel beds in which fish, eggs or fry are spawning or developing. We, the fish, the eagles, the waterfowl and the habitat appreciate your respect. Please post your comments and images on the Chehalis Flats Bald Eagle and Salmon Preserve Discussion Forum.